I love Steve Earle. I first fell for El Corazon, went back to I Feel Alright and then on to Transcendental Blues. “Ft. Worth Blues” was on repeat as I watched the moon over the Adriatic. I had people come up to me at the show at La Zona Rosa and say they had never seen anyone so into Steve Earle. I snuck up front at The Backyard and “Galway Girl” and “More Than I Can Do” always get me moving. I’ve missed some of the more recent stuff as I don’t dedicate nearly enough time to music these days, but one from 2007 will always be a favorite. Who doesn’t want to be described as sparkling? Sparkling personality, sparkling eyes. The word connotes vivacity, magnetism. When we think of celebrations, we want sparkling lights and sparkling wine. As the year ends, many of us will gather with those that have meant something to us in the past year. We will look back fondly or bid good riddance to a year we’d rather not repeat. Either way, the evening should end, or begin, with something that sparkles. You’ve got choices to make. Domestic or foreign? What’s your price point? What’s the gathering? If it is intimate, you may choose to have one or two bottles of something splurge-worthy and elegant. If you’re hosting the whole block, you probably want something that tastes great at a reasonable price so you can pour freely. I recently received some samples of Cava, sparkling wine from Spain, and Prosecco, bubbles from Italy. I’ve discovered some new French favorites and some domestic standouts. Some I have mentioned this year and some are newly tried. Either way, there is sure to be something here to fit your gathering. Feeling domestic? Try J Winery Sparkling Cuvee. Priced in the low $20s, it is affordable and delicious. Warm pears and citrus. A good compromise between splurge and a save. Another that falls into that category is Jean Charles Boisset’s JCB bubbles. The Brut and the Rose are delish and you can find them in the high teens, low 20s. If you want to try a Texas sparkler, I really enjoyed McPherson Cellars Sparkling Wine with Chenin Blanc and Muscat Canelli. A great value, too great I am afraid. It is currently sold out but look for it next year. Viva España! There are some great values if you go for Cava. Some better than others, of course. One sample of “value” Cava I didn’t care for but it made a great cocktail with grapefruit, pomegranate seeds, and bitters. I did like the Segura Vidas Brut Rosé ($10)* and was pleasantly surprised by the Freixenet Brut($11)*. Neither were overly complex but pleasant for sipping. If you want to bump it up a notch, try the Segura Vidas Reserva Heredad. * The bottle itself is beautiful. Pop the cork and find lots of beautiful bubbles, floral notes, apple, citrus and yeast. Elegant and nicely priced around $25. Oui, Oui, Mon Cheri! Last month I told you about a Cremant that I have a big crush on. Aimery Sieur d’Arques Cremant de Limoux Rosé. If you want to splurge on something pink, I’d suggest my birthday bubbles, Chassenay d’Arce, Rosé Brut, Champagne. It is 65% Pinot Noir, 35% Chardonnay and 100% delicious. Maybe it was just the fact that I had it with my mom’s strawberry cake, but it was worth every bit of the $45(ish). Two of the highlights of my year (more to come) meant Champagne. The first came in the form of the Formula 1 G.H. Mumm party which meant unlimited Champagne from the classic producer. You can never go wrong with Mumm. The Cordon Rouge, is toasty, fresh, classic and delicious. At $39, it is a special occasion wine, but totally doable.The second came in the form of a thank you from the wonderful Carin Oliver for participating in the Rodney Strong Anniversary dinner as press. Bollinger Brut Rose is a bit of a splurge at $89 but with a finish like that, it’s like getting two bottles in one. Red berries, yeast, firm minerality, and this little love lingers. Molte Bene In the mood for Prosecco? 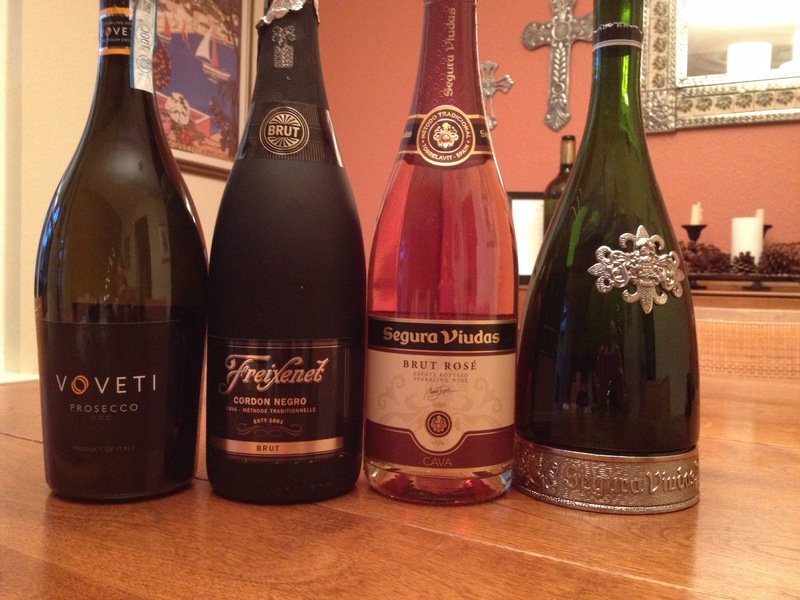 A guest favorite in my Moms-coping-with-winter-break Blind Tasting was the Voveti Prosecco. On the nose, some honey and yeast, good green apple notes and a decent finish. In general, Prosecco can be a little sweeter than Cava or Cremant. This one was indeed a little sweeter, but nice with the salty snacks. Brasil! For my (cough,cough) 40th, a friend shared this yummy number with me. Casa Valduga 130 Brut is made using méthode champenoise and was nutty, full-bodied, and tasty. A unique wine that is sure to be a conversation starter. How many wines have you had from Brazil? Now I know when Mr. Earle wrote the song, he didn’t mean “baby” like I meant “baby,” but I’ve got to say, my baby does indeed sparkle and shine. I can’t really think of anything “sparkling” without thinking of that song. So, while the lede may have you scratching your head still, I hope you still enjoy the song. 2013 has had its challenges, there have been highs and lows, but I have much to be grateful for. I hope that you will be surrounded by those you love and that there is something delicious in your glass and fabulous in your future. See you in 2014! Cheers! *These wines were provided by Janet Kafka and Associates as media samples. The opinions are my own. Great recommendations, Alissa. I love J sparklers. Sigura Viudas Reserva Heredad looks spectacular, and also delicious. And Bollinger… Probably the priciest from the well known standard Champagne bottlings, but clearly a standout. Cheers! Anyone else find that the time of year with the most drinking and celebrating is also the time of year when it is most difficult to find time to write? This piece was originally published last year. I have included a couple more Champagne suggestions in italics. I’d love to see what you open on NYE. If you get a chance, comment below with a picture and your thoughts. I’ll compile for Valentine’s Day. Hope you have a wonderful end to 2014, surrounded by those you love. Great post, Alissa! Happy New Year!